Bellwether is a complete, cloud and on-premise purchasing suite that offers full features and functionality suitable for organizations of all sizes. A service-oriented architecture-based platform, Bellwether uses a modular system design, where the functions are clustered per business process and users can select the modules required from their business requirements. This purchasing platform is extensive and flexible that it allows users to readily switch and distribute data with your other business systems, which enables users to have a more productive, simplified, and extensively automated business environment. Bellwether has been providing purchasing and inventory platforms for more than 30 years. With this extensive experience, it offers software solutions that function like how a purchasing manager would think—covering the key operational angles, with a money-back guarantee. Smart and straightforward to use, the Bellwether purchasing solution offers an easy installation to support fast usage for your business. After a short setup procedure, you can immediately use the platform to process your various purchasing tasks, including requisitions, inventory, invoice, POs, and receiving. It also supports advanced budgeting and workflow. This purchasing solution runs in most popular operating systems and gadgets, including Macs, PCs, smartphones, and tablets. Mobile friendly, it detects automatically the device being utilized and adjusts itself to allow seamless usage at all times. Its ePMX features web-based purchasing software functionalities conveniently placed at the right of the screen for easy access. The Bellwether purchasing suite also supports extensive integration with other systems that it can be easily used along with your existing applications or as a stand-alone platform. This makes Bellwether capable of supporting your need to seamlessly create a single highly efficient purchasing system for your business. Bellwether purchasing suite is easy to use and is designed in a way to help provide enhanced efficiency for your business. By providing significant operational proficiency, this application helps your business considerably cut the purchase cycle duration, decrease supply costs, and reduce administrative expenses. With its more than three decades in the industry, Bellwether has continuously improved and constantly redesigned its purchasing suite to arrive at a software solution that functions exactly how purchasing experts operate. Likewise, the installation and training only take a short time so you can start using it in a matter of a few weeks for your PO creation, quotation request and requisition tasks. Bellwether provides an extensive material and vendor file management functionalities integrated into its purchasing module. You can further hasten the purchasing process by utilizing the email and fax features. Likewise, its purchasing inventory app enables you to easily sustain a balance between your requisitions, e.g., via a guided Economic Order Quantity and the inventory on hand. Workflows can be customized to suit business-specific contexts and user preferences, including setting budget tolerances and thresholds. Its automated, browser-based purchasing order process helps you save time, allowing you to focus on more important activities such as negotiations and vendor research. This innovative platform offers a host of intuitive and advanced purchasing features. These include entering up to 999 items in one PO, easily overriding the normal ordering details for any PO line item, rename PO line item data fields in the integrated data dictionary, and automatic tax calculation of all taxable items. It also shows the running total cost as you enter each PO line item, which is also priced individually. The practice of maverick buying is practically eliminated as Bellwether allows organization-defined approval levels. As such, managers gain increased transparency in business spending across the organization, at every level and at every stage of the purchasing process. 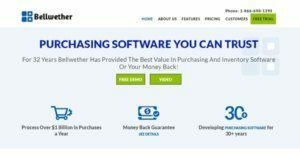 Bellwether Purchasing Software is a cloud-based solution that provides extensive customization and flexibility to cater to your particular needs. Aside from providing a completely free plan, its paid subscription is available to as much number of users as required by your business. What Problems Will Bellwether Solve? Solution: It is compulsory for state-supported higher education institutions to operate within a set of government-specified rules and standards. For example, they are obliged to conduct biddings every time they make a purchase. Because many of these items are bid repeatedly every year, the functional material file stored in Bellwether significantly reduces the volume of work necessary to successfully conduct bidding activities. The program facilitates all the needed preparations to help simplify and hasten the entire bidding process. Aside from these, Bellwether’s reporting features streamline the reporting requirements for the various periodic documentary obligations of state-funded colleges and universities. Solution: Many businesses nowadays still use their legacy purchasing systems for various reasons, including sizable technology investments and substantial systemic and procedural changes. Most of these legacy systems often require numerous commands to complete a particular task. From making over a dozen clicks to print a purchase order, Bellwether Purchasing Software allows you to have a PO printed in a matter of 2 clicks. Aside from considerable time savings, this platform can help reduce your processing time to up to 50%. This is a very welcome change especially if you process thousands of POs annually. Solution: Businesses with facilities spread across various regions need to implement a PMX system using a remote setup. This setup is typically slow given the distance of the facilities from the HQ, especially when multiple users are logged in simultaneously. New Bellwether Purchasing system does not only provide fast remote PMX setups, it also helps boost productivity and increased flexibility, such as for RFQs preparation and PO completion. If you are considering Bellwether it might also be beneficial to examine other subcategories of Best Procurement Software listed in our base of B2B software reviews. Enterprises have diverse wants and requirements and no software solution can be perfect in such a scenario. It is futile to try to find an ideal off-the-shelf software app that fulfills all your business wants. The wise thing to do would be to adapt the solution for your special needs, employee skill levels, budget, and other elements. For these reasons, do not hurry and invest in well-publicized popular applications. Though these may be widely used, they may not be the perfect fit for your unique needs. Do your homework, investigate each short-listed system in detail, read a few Bellwether reviews, speak to the maker for explanations, and finally choose the application that presents what you need. How Much Does Bellwether Cost? Bellwether offers flexible pricing based on the number of employees. ePMX Enterprise (Mid-sized and Large Businesses) – per User or Concurrent License. $40 per user a Month for 25 users; $25 per user a month for 50 users; $18 per user a month for 100 users. We realize that when you make a decision to buy Procurement Software it’s important not only to see how experts evaluate it in their reviews, but also to find out if the real people and companies that buy it are actually satisfied with the product. That’s why we’ve created our behavior-based Customer Satisfaction Algorithm™ that gathers customer reviews, comments and Bellwether reviews across a wide range of social media sites. The data is then presented in an easy to digest form showing how many people had positive and negative experience with Bellwether. With that information at hand you should be equipped to make an informed buying decision that you won’t regret. What are Bellwether pricing details? What integrations are available for Bellwether? If you need more information about Bellwether or you simply have a question let us know what you need and we’ll forward your request directly to the vendor.